Right now, I’m working on a book series about the Mandela Effect. The first book – which has been my main focus for the past few weeks – is going to be a quick overview for those with a casual interest in the topic. For me, it’s another reminder that people don’t always “hear” text the way it was intended. But, as I’m researching others’ explanations for this quirky phenomenon, I’m also seeing some bizarre interpretations of things I’ve said online. Oh, it’s not news that snarks, hyperbole, and sarcasm rarely convey clearly in text. In the case of the Mandela Effect, I’ll have to include musings and “what if…?” speculation to that list. For me, the Mandela Effect is like other paranormal topics I’m studying. I have absolutely no doubt that something odd is going on. Also, I’m fairly sure that the Mandela Effect – like ghosts, faeries, and related subjects – can’t be explained (or shrugged off) with just one, all-purpose explanation. In the case of the Mandela Effect, too many disparate reports match up in eerie ways. They can’t be dismissed as just one or two people (or even a troll collective) submitting prank reports. The “false memory” label doesn’t fit the reports, universally. Nor can I attribute something as widespread as the Berenstein Bears’ issue as a literacy problem, or any of the myriad other explanations skeptics like to insist upon. However, as much as I like the parallel realities concept – and feel that, in a way, it’s kind of an Occam’s Razor answer – I’m not going to insist on it. That’s too funny. Of course I don’t claim that. I offer the multiverse theory as one speculative, fun explanation. But – even if it’s among my favorite, “what if…?” theories – it’s only one of many. And, if I were discussing the Mandela Effect seriously, the multiverse would be far down the list of most likely explanations. Oh, back in the early days (2009- 2010), Mandela Effect conversations were different. We were a small group – maybe a dozen or so people – sharing thoughts via comments at my website. I’m pretty sure all of us knew the difference between when someone was serious, and when they were having fun with “what if…?” speculation. By April 2011, far more people had joined the conversation. Some took the topic more seriously than others. In general, the tone was still “what the heck is this, anyway?” as we tried to sort the evidence and possible explanations. In other words, few people – including me – locked into just one reason for the Mandela Effect. Our conversations were sincere, but also light in tone. Most of us recognized how strange it all sounded, even to us. Then, in 2015 after the Berenstein/Berenstain Bears topic went viral, I guess my whimsical tone of voice didn’t convey well in what people read. Or they didn’t go back to see the wide range of theories and banter we’d already shared. So, some mistakenly think I take everything very seriously, and insist on just one Mandela Effect theory. Broome believes memories that are out of sync with recorded history occur because our minds get entangled with alternate universes. According to the “Many Worlds” hypothesis proposed by quantum physicists Hugh Everett and Bryce DeWitt, the world splits into parallel universes every time a quantum event happens. Thus, while Nelson Mandela did not die in prison in the 1980s, at least in this universe, there is some other universe in which this did occur. And Broome’s memory of the event is proof that her mind has come into contact with that alternate universe! Umm… no. My own late 1980s’ memory could be badly flawed. It could be a mish-mash of several funerals in TV news reports. I’ve never claimed otherwise. In fact, that’s why I’d never mentioned that memory until someone else (Dragon Con’s security manager, Shadow) brought up the topic. I was absolutely amazed that anyone else shared that weird, unsupported memory… much less thousands of people. In fact, it’s probably an understatement to say I was amazed. Utterly stunned and flabbergasted might be better terms. But even (or perhaps especially) knowing that others share the memory of Nelson Mandela’s funeral in the late 1980s, “normal” explanations elude me. A few things really baffle me. They include others’ reports with details (that I’d omitted from public posts, deliberately) that matched my memories of the Mandela funeral, 100%. Also, I’ve never found other funerals from that era with details that I could have conflated. Yes, most critics insist I’m remembering Steve Biko‘s funeral, but that was in 1977, when I lived in northern California. The funeral I recall was on the TV when we lived in Florida, so that places it between 1987 and early 1990. Also, the TV coverage continued for days, at least two and possibly three. But, being somewhat skeptical by nature, I’m still not certain that my memory of the Mandela funeral is accurate. I’m open to other explanations. As a Mandela Effect researcher, I try to keep an open mind. Also, in addition to trying to explain my memory of that funeral, I’m looking for an explanation for the thousands of other people who seem to share that quirky memory. Like me, they seem to recall several days of TV coverage, the outdoor speeches under a big tree, the emotional widow and her bodyguard, the odd assortment of folding chairs, and so on. Lots of details that usually (but not always) match my memories. That still seems very odd, and I’m still hoping for a simple, non-weird explanation. Of course, the person who wrote that article might have written it as humor. Again, text doesn’t always convey tone of voice. It’d be kind of cool if I did feel confident that I’d crossed time, space, or dimensions, and ventured into an alternate world. That sounds like tremendous fun. Alas, I don’t have that kind of confidence, though I love the parallel realities explanation. Among all the options, it’s easily my favorite, and it seems to resonate with many of my friends and fans. Even better, quantum studies seem to suggest that parallel realities are, well, real. So, that could be the best, single explanation for my “alternate” memories, and others’. But… yes, I’m still looking for patterns that will explain paranormal phenomena, including the Mandela Effect. I’d love simple, single answers. Meanwhile, I’m in a world where writing books still involves research, putting words on a page, editing those words, and then publishing them. But hey, if anyone knows the gateway to a universe where thoughts go directly to printed words and then magically appear in books, let me know. As someone who’s always preferred a quiet life, I’m always astonished (or perhaps aghast) when something I do attracts attention. This week, it’s the X-Files. Really, they created an X-Files (reboot) episode around the Mandela Effect. I’m about to watch it on Hulu, and try not to act like a hyper-protective parent, as if the Mandela Effect is entirely mine. Of course, my Mandela Effect website kind of started it all. Do most people know that? I haven’t a clue. I mean, yes, I popularized the phrase… but the truth is: I had the help of a few hundred thousand (or more) people who’ve had something to say about the topic, regularly. And at least several million more who’ve shown interest. But still, seeing the Mandela Effect featured in an X-Files episode, for heaven’s sake… that’s just surreal. And, I’ll admit, kind of cool. It’s like a part of my life, and it’s on the TV screen. I can’t seem to grasp that this is happening. Even if the show is tongue-in-cheek parody/humor. At the moment, I’m stunned. And kind of chuckling over how weird this is. And then I’m back to blink-blink mode, kind of overwhelmed. Since that TV show will bring a lot more attention to the Mandela Effect, I threw together some free iron-on designs that fans can use for DIY t-shirt printing. 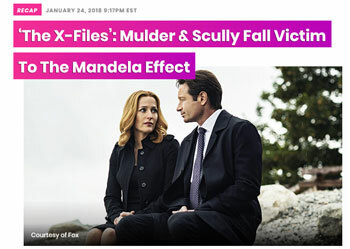 They’re linked in my MandelaEffect.com article, That X-Files Episode.